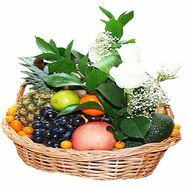 Flowers and fruits in the basket will be your wand-zashchalochkoy. 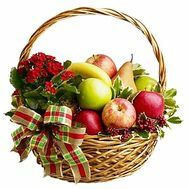 Brightness and brilliance of colors combined with the fruity aroma and juiciness of each individual fruit make this gift perfect. 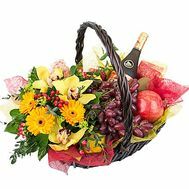 Its natural appeal allows you to present such baskets and compositions for a variety of reasons, surprising and delighting day by day! 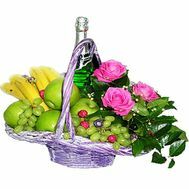 Fruits and flowers - the basic combination in a gift, the same necessary as flowers and sweets. Often we ask ourselves what to give to a particular person and do not find an answer. After all, not all recipients can like sweet, soft toys or use elite alcohol. 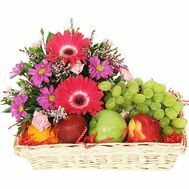 In this case, there is a combination of bouquets of flowers and fresh fruits. 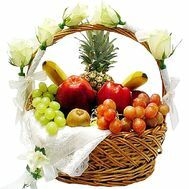 After all, fruits like everything, from small to large. And there is no man who refuses a delicious fruit slice. 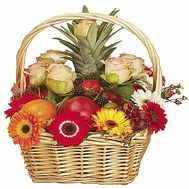 A composition of flowers and fruits in a basket is a universal gift. 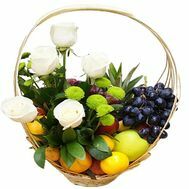 Flowers with fruits are given to both very young and old people, and this is all their charm - you will never make a mistake with the recipient by choosing a bouquet of flowers and a fruit basket. 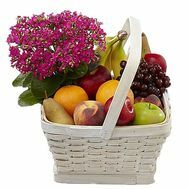 It is best to buy flowers in a beautiful fruit basket as a wish of recovery to a colleague or family member. 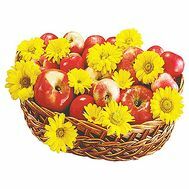 Buy flowers and fruits in the basket can also be favorite kids for the New Year: juicy fruit paired with delicate flowers decorate this heat-deprived holiday. Our online store is a great choice for people who value their time and money. 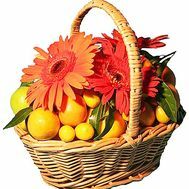 We have not only the most democratic prices, but also bouquets and compositions from the best florists, experienced managers and fast couriers. 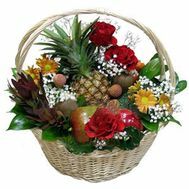 Fast and high-quality delivery: our all-Ukrainian flower delivery service is a subject of our pride. 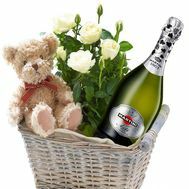 Our couriers work quickly and efficiently, delivering beautiful gifts throughout Ukraine! Our store provides discounts to regular customers in the form of a funded system: the more purchases - the bigger and the palatable the discount. In addition, we have a lot of customer feedback, which has already tested all the innovations and services from our store, and everyone can familiarize with them. 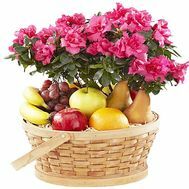 Also we can make a photo of the recipient after delivery and send it to you in the mail, as a confirmation of delivery and a reminder of a pleasant moment. Our many years of experience can be trusted, because we are doing everything possible to ensure that happiness never left any Ukrainian home!